Yesterday was the release day of Veeam Backup & Replication 6.5. 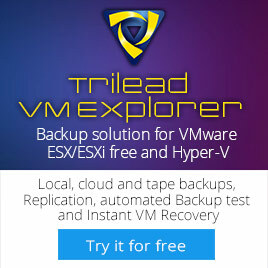 The first backup solution with full support for vSphere 5.1 and Windows Server 2012 Hyper-V 3.0. I think the following features and enhancements are worth an upgrade. If you’re running a vSphere shop. recovery) of VMware VMs directly from array-based snapshots. Reminder: Although SAN snapshots can provide excellent RPOs (recovery point objectives) for certain operational disasters, they cannot serve as real backups since they would be lost along with production data in the event of a storage disaster. Thus, you should never rely solely on SAN snapshots for data protection. To ensure protection against all types of disasters, continue to perform regular backup of all VMs to backup storage using Veeam backup jobs or VeeamZIP™. Veeam Backup & Replication 6.5 provides full support for VMware vSphere 5.1. Windows Server 2012 or Windows Server 8.
several times, depending on backup storage). resource utilization for backup jobs with backup files over 16TB in size. reduced up to 3 times. Network packet loss. Increased the processing engine’s tolerance to network packet loss. Network traffic verification engine. New network traffic verification engine detects and automatically recovers from in-flight data corruption caused by malfunctioning network equipment and similar issues. 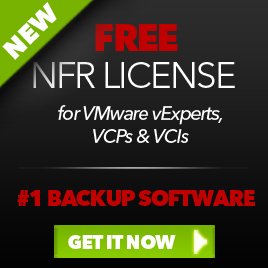 Backup & Replication in a network with NAT and firewalls. or on a network share. striped, mirrored and RAID-5 volumes. actual drive letters from restored guest OS settings (rather than simply assigning in sequential order). transport modes by disabling excessive VDDK logging. between the backup server and the destination VM. You can read about the rest of the enhancements in the What’s new PDF here. Personally I hope that I can find some time to test the Restore from SAN snapshots feature soon. We are running a huge Lefthand shop so this feature might become handy in the near future. This entry was posted in Veeam and tagged 6.5, Backup & Replication, Release on October 26, 2012 by afokkema.